Road Safety is an important education for people of all ages. From crossing the road, to cycling to driving a four wheeler everyone should know the rules of the road. The rules are created keeping the uniformity of people in mind so that each person can follow the same set of rules to help one another to drive safely from cyclists, car drivers, pedestrians and so on without any discordance. Observation is the key point in road safety. In order to obey or follow the rules of the road, one must be educated on what, when and why they work. The right education to know about road safety starts from school. And obeying such rules becomes a responsibility of safeguarding oneself and the others on the road. The following paras highlights about the importance of road safety, safe driving tips and suggestion for improvements. Hand Signals: Hand signals are important to let know the other drivers behind and beside you that you are going to change your direction or lane. 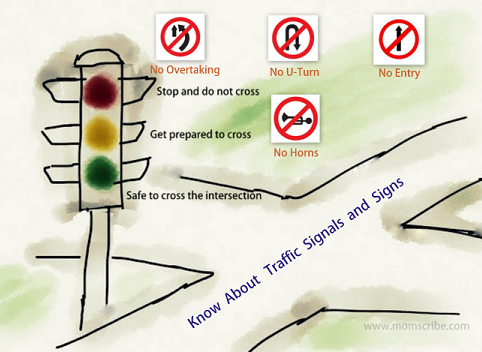 By using hand signals, a lot of confusion and accidents can be avoided. The basic hand signals to note are: to slow down the vehicle, you should extend your right hand swinging it up and down with your palm facing downwards, for stopping the vehicle raise your forearm vertically outside and to let the vehicle behind you to overtake, just swing the right arm forward and backward in a semi circular motion. Direction Indicators: Driving indicators helps in times of darkness and also in place of using hand signals. It is mandatory to maintain adequate distance between other vehicles before changing the lane or direction and even while travelling for safe driving. Traffic signs and signals: Every intersection of the road has two or more traffic signals whose color codes (Red, Orange, Green) indicates different meaning to allow safe walking and travelling. Also, traffic signs for one way, U-turn, schools, hospital, prohibited zones, no horns area, etc. should be known by all drivers to avoid road mishaps and penalties. Lanes of the Road: You must stay on the left hand side of the road at all times unless you are overtaking if there are more than two lanes on the road. And in case of overtaking to change your lane, always signal both in terms of hand signal and direction indicators to let know others that your changing your lanes. Always avoid regular lane changing. Setting a permissible speed limit has proved to be an effective measure in controlling traffic and safety. People driving on roads should follow these rules and many highway police in India are making use of automated instruments through which they can track the speed of vehicles. The penalty of violating speed should be made compulsory and even for all people regardless of their class or status. The Speed Witness Radars can be installed in high traffic areas and highways in every part of the city in India. Radar speed measuring device works by emitting an electronic beam on a moving vehicle which in turn gets reflected back to the unit giving the speed of the vehicle. This is known as Doppler Effect or Doppler Shift. Always wear seat belts on a four wheeler: Seat belts on four wheeler should be made mandatory for travelling on the road. The seat belt acts as a protector nullifying the effect of inertia as said in Newton's First Law of Motion. In simple words, when a car is travelling in a particular direction, the person seated in the car too continues in the same direction. But when the car collides with some object with a sudden halt to the car, the person seated on the car is been thrown forward to balance the sudden bounce back off the car which causes a lot of damage both to the car and the person seated on it. Wearing a seat belt will help you from hitting forward and minimize the damage. It has been found that wearing seat belts has saved a lot of lives in India after its invention and utilization. 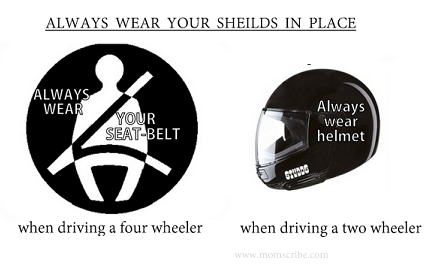 It is also important to wear the seat in proper condition to increase the chances of survival. Always wear helmet on a two wheeler: Wear helmet saves from unwanted head injury when something happens while travelling in a two wheeler. Always give way for others to avoid collision. As much as shielding oneself, it is also crucial to check the condition of your vehicle before taking it to the road. From checking the petrol/diesel limit, glass wipers to checking the air pressure in the wheel tyres, it is important that you are not left abandoned in the middle of the road whilst driving. Also, it is very important to check for bald tyres in rainy seasons to avoid skidding and being prone to accidents. 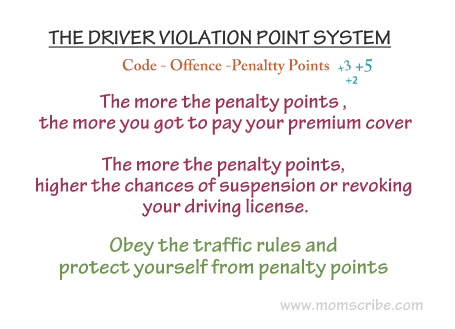 The Driver Violation Point System is a way to identify and take action against high risk drivers. The Department of Motor Vehicle in the US and even in the UK, offers Motoring Penalty Codes And Points assigning points for most traffic violations which in turn is registered in the driver's driving record. A certain number of points are allocated for different and common traffic violations like speeding, reckless driving, improper cell phone use, inadequate brakes, safety violation of not using a seat belt, etc and are recorded in the driving record in times of violation. The points recorded in the driving record determines the fate of your future driving - the more the points, the more costlier is your insurance premiums as well as results in the suspension or revoking your driving license. You got to pay a high fee to get back the license. Yes, face the charge sheet for careless driving. A similar system of points allocation and recording should be introduced and followed in India for safe driving. Indian roads are filled with banners of models, jewellery and other ads in almost every road which in fact distracts drivers while travelling especially in between the lanes of the roads. Instead, one or two such banners on every road can display the traffic rules in pictures. By seeing them every day, even the ones who don't have enough education on the same will get to know all about road safety. 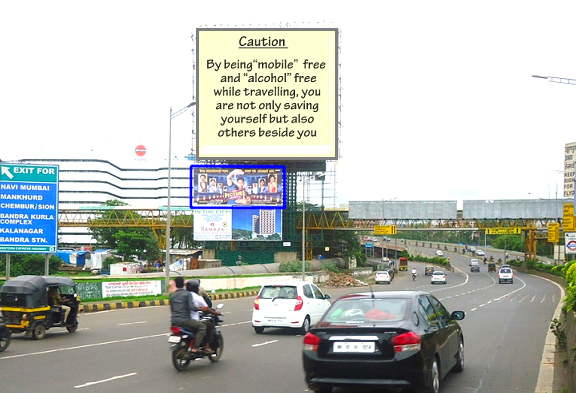 In high traffic areas, banners like " Using Mobile while driving kills your life. Instead, stop and park your vehicle in a safe corner of road avoiding unwanted blockage to attend the call in case of emergency" will sure prove to be fruitful. Car Insurance or any vehicle insurance is important and should be made mandatory for driving on the roads. Being covered helps in making a claim for accident recovery and also offers a courtesy car in the event of damage, fire or malicious damage. 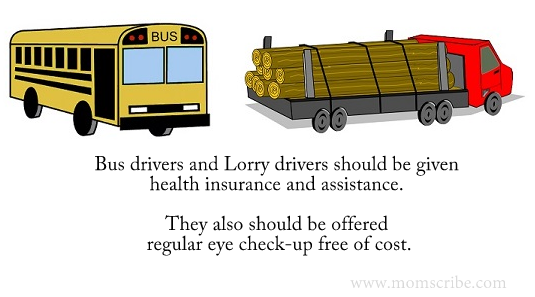 Public drivers, especially bus drivers and lorry drivers should be given health insurance and assistance. They also should be offered regular eye check-up free of cost. From the very first Hindustan motors to the current Micra cars from Nissan, vehicle engineering has played an important role in making a vehicle accident proof reducing a number of road accidents. Fog lamps to help to drive safe during fogs, instrument graphics for greater clarity, anti glare glasses, seat belts and safety air bags are some of the improved features which play a major role in road safety. Safety designs have helped in reducing the road accidents and hence it becomes vital to consider these features when choosing a vehicle. 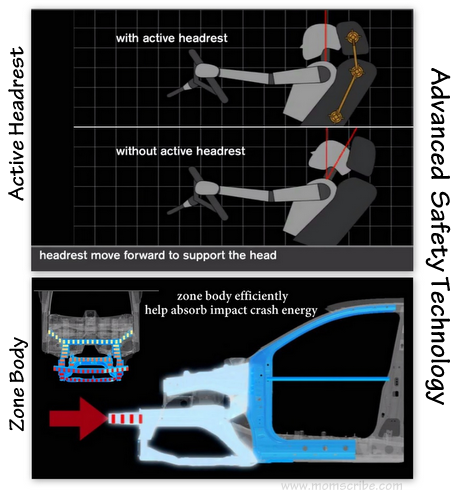 New features of the current version of Micra cars from Nissan has an active headrest to move forward supporting the head and a zone body which efficiently help absorb impact crash energy using high energy absorbing side members and large bumper reinforcement are worth considering when it comes to safety design of the car. Roads in India suffer a strange fate that every time it rains heavily, the roads are filled with potholes which might turn dangerous to cyclists, bikes and other vehicles. Considering the aftermath, roads should be constructed keeping in mind a lifespan of at least 5 to 6 years without potholes which in turn reduces an enormous amount of money going into fixing them every year. Also, it is very important to display fluorescent tape and other warnings clearly in big letters, including penalty when not followed for accident prone zones, bumps on the road, crowed areas, school zones, hospitals and construction work undergoing areas. It is one of the important factors for speed driving and if not handled well leads to road mishaps. Most often people rushing to schools and offices driving fast fall under improper time management. This not only hinders the safety of the driver, but also other people driving on the road. Hence making an early move for driving to your desired destination should be followed as it is vital for safe driving on the road. A good post.Many of the tips are known.The problems are many- drivers' impatience ,non adherence to lane system,two/three wheelers,jay walking and a disdain for rules if policeman is not in the vicinity. Very comprehensive post Uma! Best of luck for the contest! Very nice post. Parents should not give vehicles to kids who are under 18 age, After getting driving license only, they should allow driving.